After moving back to Bangalore, life has become more hectic than what I expected it to be. Setting up a home is taking all of my time &amp; leaving me exhausted at the end of the day. Though we are settling down slowly, there are many tasks yet to be completed. In this tiresome schedule, one of the things that I am thoroughly enjoying is the FOOD. I get to eat all those I craved for. I have visited so many food joints that I feel I should start giving my reviews about them. Anyway, I'll keep that in the back of my mind &amp; plan to kick it off on a rainy day! Okay!,from now on I'll try to be regular (hopefully!) in putting up my experiments &amp; also try to take a peek into the blogs I admire. Coming to the recipe now. This is my son's yellow idli &amp; I prepare it whenever he asks/requests/demands for it. 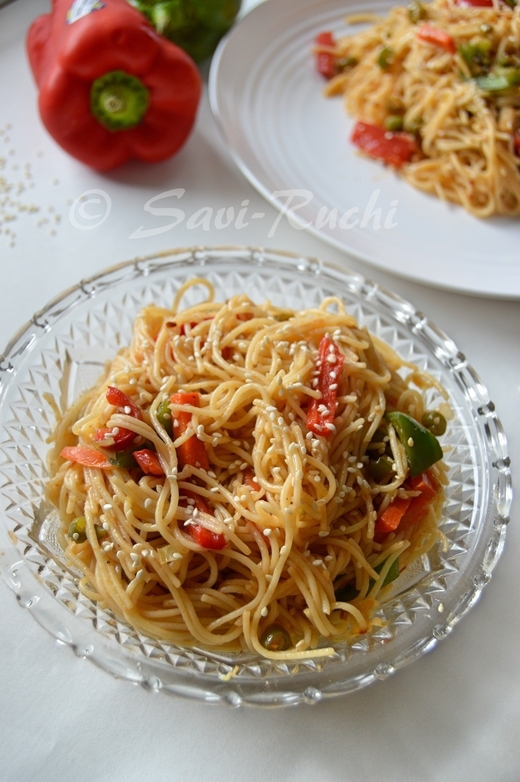 It is super easy &amp; can be prepared in less than 20mins time. 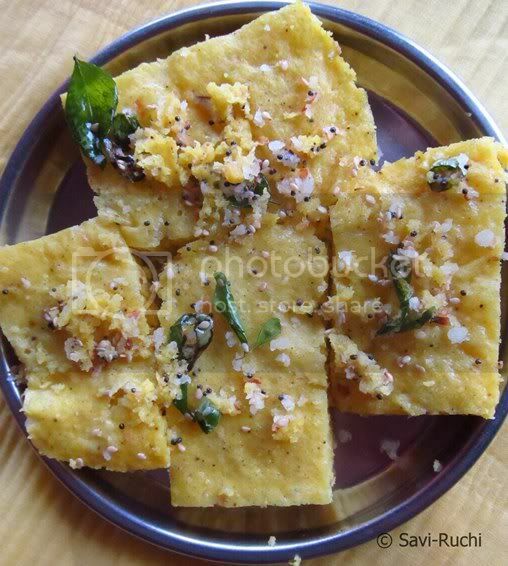 Here is my version of the nylon khaman or khaman dhokla. 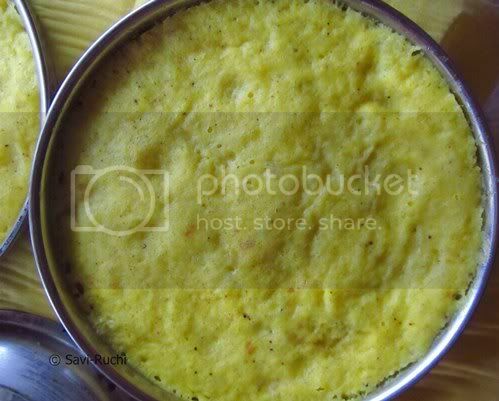 Besan/Gram flour/Kadale hittu: 1.5 cups (1 cup holds 250ml of water). Citric acid crystals: 1/2tsp, or 2 tbsp lemon juice. Fruit salt: 1.5 tsp or 7gms approximately. Mix all the ingredients(except fruit salt &amp; water) mentioned in the ingredients section. Add few tablespoons of water at a time &amp; make a lump free batter. 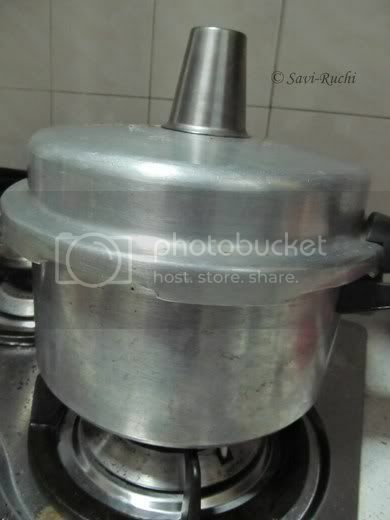 The batter has to be very smooth with the consistency similar to that of an idli batter or a thick milk shake. Let the batter rest for 2-3 mins. Meantime, prepare the steamer. Add water to it &amp; allow it to boil. Grease the plate with few drops of oil or spray. Add the fruit salt to the gram flour batter &amp; mix. The batter will become frothy, light &amp; increases its volume. 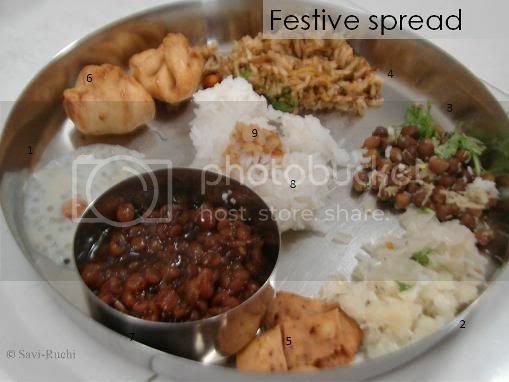 Immediately pour it on to a greased plate/thali. Place the plate in the steamer &amp; steam it for 10mins. A skewer inserted should come out clean. Prepare the tempering. Heat oil in a pan. When oil is hot, add mustard seeds. When seeds splutter add sesame seeds followed by curry leaves &amp; green chilies. Keep the tempering aside. Allow the cooked khaman to rest for a minute. Sprinkle few drops of water over the cooked cake to keep it moist. Cut the steamed cake into desired shape (when it is still warm), pour the tempering over the steamed cake. Garnish it with coriander leaves &amp; serve it hot with any dip of your choice. Green chutney is a great combination with nylon khaman. Do not try to cut down on the oil used while making the batter. The dhokla might turn hard. Use good quality fruit salt. Fruit salt that is stored for a long time will not give desired results. Use 1 packet of Eno's fruit salt(5gm packet available in India) for 1 cup of gram flour. You can make this khaman sweet n sour or khatta meeta by adding 2 tbsp of sweet n sour water. (Add 1 tbsp of lemon juice + 1.5 tsp of sugar to 2 tbsp warm water). Dissolve the sugar &amp; sprinkle the water over the hot steamed cake. The gram flour to water ratio is 1:1. 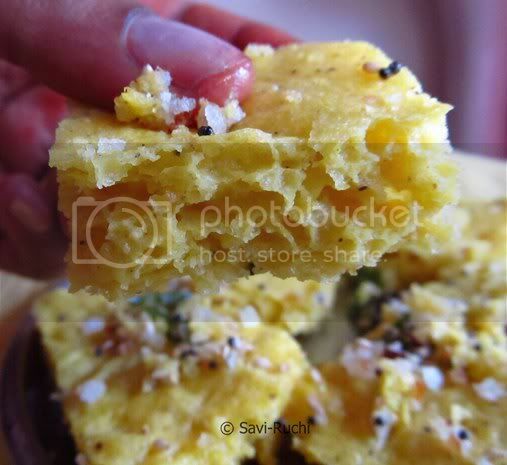 In case, you do not have a steamer, use the pressure cooker to prepare the khaman dhokla. Do not add the weight, instead place a steel tumbler (as shown below). 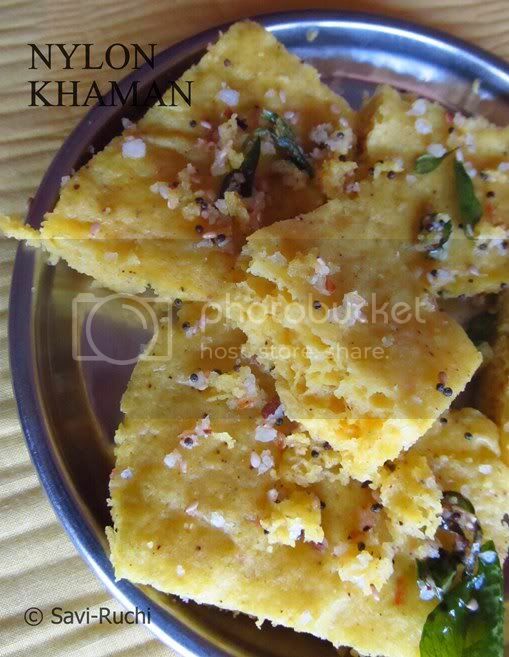 If you are planning to prepare the khaman in bulk, it is better to invest in a khaman dhokla stand. Refer picture here. Here is a teeny-weeny effort from me. Will keep updating the list & try to include as many as possible. Your inputs & comments are most appreciated. Thank you.